Why do women make less than men? You probably know that women earn about 80 cents on the dollar compared to men (specifically, this refers to median full-time wages). You may also know that after narrowing for decades, the gender pay gap has remained essentially stuck since the 1990s. 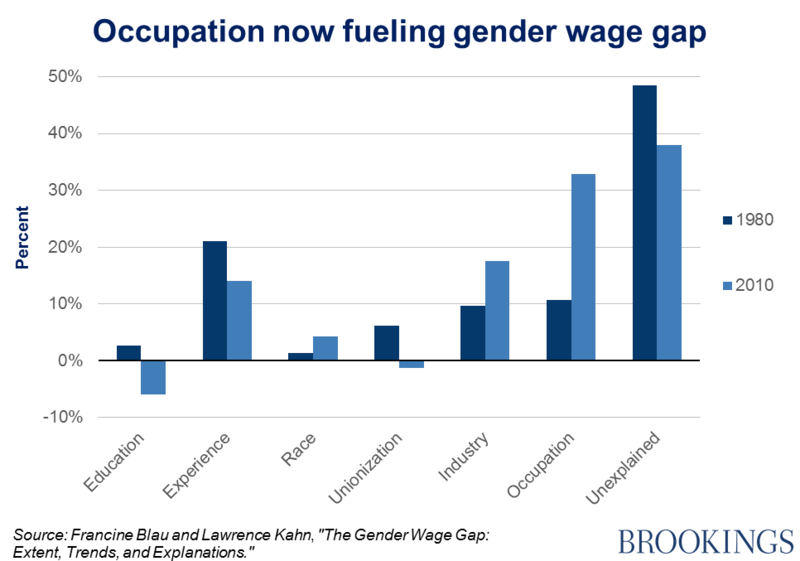 So, why are women in lower-paying occupations? Certainly not because of a lack of education or skills: if anything, women are now outpacing men on the educational front. Part of the problem is that certain occupations and industries are seen as “men’s jobs” or “women’s jobs.” Compensation patterns in many jobs may still reflect historical patterns when explicitly discriminatory practices partitioned even the most educated women into lower-paying fields like nursing and K-12 teaching. As the barriers of explicit gender discrimination in the labor market started to fall, educated women increasingly chose other jobs. This led to an initial narrowing of the wage gap, but the refusal of men to move towards these important but historically “female jobs” has helped to thwart further convergence. While STEM fields tend to attract men, those that Isabel Sawhill and I have labeled HEAL jobs (in health, education, administration, and literacy) remain disproportionately female and also less well-paid. There is apparently nothing innate about these occupational preferences. In fact, both men and women tend to select occupational fields that fit gender stereotypes rather than their own individual interests. Young women with a range of interests that would suggest a good match for a business career nonetheless plan a career in health sciences. Men with interests pointing toward education jobs choose engineering. This suggests that gender stereotypes about work result in a mismatch between interests and careers. Women might also select an occupation known for greater flexibility, anticipating the demands of motherhood. In which case, the solution is two-fold: equalize parenting responsibilities, and introduce more flexibility into traditionally male workplaces. There is, after all, scant evidence that macho working hours and styles have served Wall Street or other sectors very well. So far, progress on gender pay equity has been driven by a combination of legislative action and shifting social norms on equal pay for equal work. Future advances are likely to require a fundamental rethinking of gender roles in relation to both paid and unpaid work—and as much for men as for women.